With technology changing and upgrading at lightning-fast speed, the increasingly diverse generations working together have to deal with the different views and customs each generation has with technology. Newer generations just entering the workforce have a different way of dealing with social media. Last year, the Kaiser Family Foundation released a study revealing teenagers spend an average of 53 hours a week engaged in electronic media, which doesn’t include the 90 minutes they spend texting every day. It can be difficult trying to figure out what is and isn’t acceptable behavior in the workplace regarding modern technology like MP3 players, smartphones, and social media sites. If you follow this easy guide, you’ll be able to better figure out how to enjoy your gadgets without disrupting those around you. It’s important to double check your company’s policies and procedures. More companies are adopting social media policies every year and it’s important to reassess what is considered acceptable use of modern technology at work. You should also be mindful of your employer’s culture and unspoken etiquette. Some companies may be more relaxed on their policies and won’t punish you for having your phone out while working. Others might block access to certain social media sites or request you leave some devices in the car. Emails and text messages have been great tools to save time and effort by giving you the chance to send messages to anyone, anywhere. Thanks to modern messaging, the need to attend long meetings or conference calls has been reduced. But, nothing can duplicate the real connections you get with face-to-face conversations. If you’ve sent a message to a co-worker and haven’t heard back, leave your workstation and visit your colleague. It’s easy for text messages and emails to get overlooked in the shuffle of life, but a real phone call or office visit can guarantee your message is received. Thanks to the popularity of MP3 players like Apple’s iPod, younger employees have grown accustomed to a kind of culture where headphones are used just about anywhere except in class. 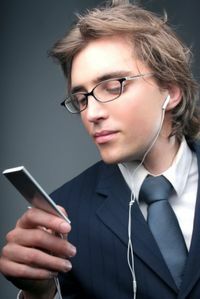 If your employer allows headphones while working, be courteous and inform your co-workers that you will be using them and find a reasonable volume so it won’t disrupt them as they work. When colleagues approach you, take out your headphones and devote your complete attention to them. You may feel like you can do both, but it’s a gesture of respect to take out your headphones when talking to your co-workers. You may feel like you’re doing your workmates a favor by silencing your latest ringtone, but if you leave your phone on your desk or hard surfaces near your workstation, the vibration could be heard by everyone around you. If you have to have your phone with you, turn the vibration off or put it in your pocket so the buzzing will be muffled. Just because you use Facebook, Twitter, or a personal blog profile to talk about life on your free time, it doesn’t mean you should involve work or your co-workers without permission. What happens in social media is there forever. What you say can and sometimes will come back to find you. Think twice before updating your status or writing a post about a co-worker with an annoying laugh, obvious hairpiece, or smelly odor. Not only can having questionable content on your social media sites negatively impact your career, it can also impact those you work with. You may not be Facebook friends with your boss, but posting a video of you and a co-worker having a blast somewhere with the caption “we should be at work, lol” could get back to your boss. Social devices have added some complications to proper etiquette in today’s workplace, but as long as you use good judgment and have respect for your co-workers, you can enjoy your gadgets while still being professional.